Madonna is always reinventing herself. In her latest role, she's a humanitarian with an ambitious plan to care for orphans in the AIDS-ravaged African country of Malawi. "For the last few years — now that I have children and now that I have what I consider to be a better perspective on life — I have felt responsible for the children of the world," the 47-year-old pop star tells Time magazine in its issue on newsstands Monday. The singer has two children, a daughter, Lourdes, 9, and a son, Rocco, 5. "I've been doing bits and bobs about it, and I suppose I was looking for a big, big project I could sink my teeth into." She has found one — and it's as about as high-profile as her ongoing "Confessions" world tour. Madonna plans to raise at least $3 million for programs to support orphans in Malawi and is giving $1 million to fund a documentary about the plight of children there, Time reports. The singer, who plans to visit Africa in October, credits her faith in Kabbalah with shifting her priorities. "One of the main precepts of Kabbalah is that we're put on this earth to help people," she says. "And your job is to figure out how you can help, and what it is that you can do." An orphan care center, being built with a goal of feeding and educating about 1,000 children a day, will have programs based on Spirituality for Kids, Kabbalah's children's program, Time says. That's not all. She has teamed with developing-world economic leader Jeffrey Sachs on programs to improve the health, agriculture and economy of a village in Malawi, Time says. She's also met with former President Clinton about bringing low-cost medicines to the area. On Thursday, religious leaders in Italy criticized Madonna for wearing a crown of thorns and singing while hanging from a mirrored cross on her "Confessions" tour. The prospect of the scene being repeated at her concert Sunday in Rome's Olympic stadium, some two miles from the Vatican, prompted Catholic officials to denounce the act as a publicity stunt in bad taste. "To crucify yourself in the city of the pope and the martyrs is an act of open hostility," Cardinal Ersilio Tonini was quoted as saying in the La Stampa daily on Wednesday. "It's a scandal created on purpose by astute merchants to attract publicity." Muslim and Jewish leaders also criticized the concert stunt. 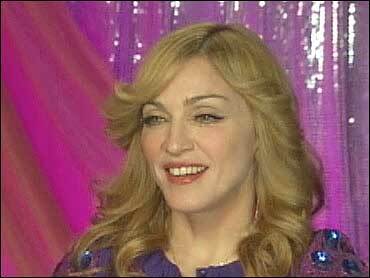 "It's not the first time Madonna stages such an act. We deplore it, we feel it is an act of bad taste," said Mario Scialoja, president of the Muslim World League in Italy. "We express solidarity with the Catholic world," said Riccardo Pacifici, spokesman for Rome's Jewish community. "It's a disrespectful act, and to do it in Rome is even worse." A phone message left for Madonna's New York-based spokeswoman, Liz Rosenberg, wasn't returned Thursday. Tickets for the Rome concert were selling quickly, with only about 100 left by Thursday, news agency ANSA reported.